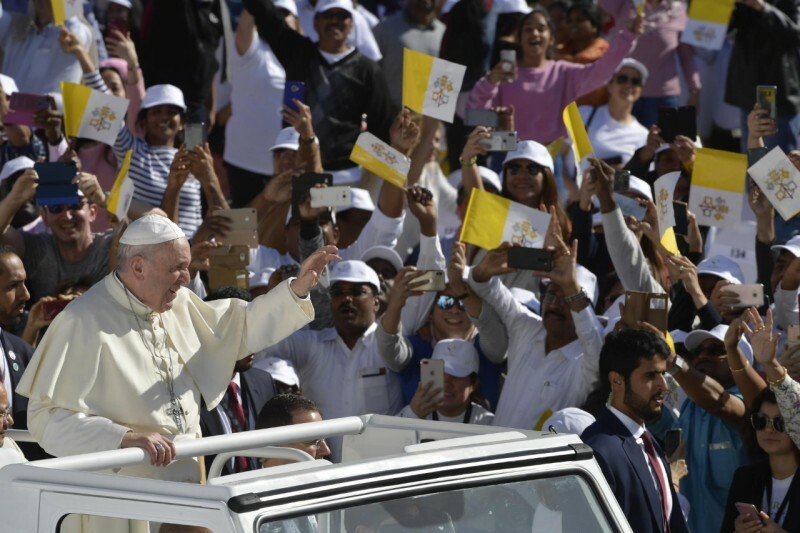 Pope Francis on February 5, 2019, celebrated Mass in Zayed Sports City with a crowd estimated at 180,000, mostly expats from some 100 countries. Following is the Holy Father’s homily provided by the Vatican. Blessed: this is the word with which Jesus begins his preaching in Matthew’s Gospel. And it is the refrain he repeats today, as if to fix in our hearts, more than anything, an essential message: if you are with Jesus, if you love to listen to his word as the disciples of that time did, if you try to live out this word every day, then you are blessed. Not you will be blessed, but you are blessed; this is the first truth we know about the Christian life. It is not simply a list of external prescriptions to fulfill or a set of teachings to know. The Christian life, first and foremost, is not this; rather, it is the knowledge that, in Jesus, we are the Father’s beloved children. The Christian life means living out the joy of this blessedness, wanting to live life as a love story, the story of God’s faithful love, he who never abandons us and wishes to be in communion with us always. This is the reason for our joy, a joy that no one in the world and no circumstance in our lives can take from us. It is a joy that gives peace also in the midst of pain, a joy that already makes us participate in that eternal happiness which awaits us. Dear brothers and sisters, in the joy of meeting you, this is the word I have come to say to you: blessed! Even as Jesus calls his own disciples blessed, we are yet struck by the reasons for the individual Beatitudes. We see in them an overturning of that popular thinking, according to which it is the rich and the powerful who are blessed, those who are successful and acclaimed by the crowds. For Jesus, on the other hand, blessed are the poor, the meek, those who remain just even at the cost of appearing in a bad light, those who are persecuted. Who is correct here: Jesus or the world? To understand this, let us look at how Jesus lived: poor in respect to things, but wealthy in love; he healed so many lives but did not spare his own. He came to serve and not to be served; he taught us that greatness is not found in having but rather in giving. Just and meek, he did not offer resistance, but allowed himself to be condemned unjustly. In this way, Jesus brought God’s love into the world. Only in this way did he defeat death, sin, fear and even worldliness: only by the power of divine love. Let us together ask here today for the grace of rediscovering the attraction of following Jesus, of imitating him, of not seeking anyone else but him and his humble love. For here is the meaning of our life: in communion with him and in our love for others. Do you believe in this? I have also come to say thank you for the way in which you live the Gospel we heard. People say that the difference between the written Gospel and the lived Gospel is the same difference between written music and performed music. You who are here know the Gospel’s tune and you follow its rhythm with enthusiasm. You are a choir composed of numerous nations, languages, and rites; a diversity that the Holy Spirit loves and wants to harmonize evermore, in order to make a symphony. This joyful polyphony of faith is a witness that you give everyone and that builds up the Church. It struck me what Bishop Hinder once said: that he not only feels himself to be your shepherd but that you, by your example, are often shepherds to him. Thank you for that! To live the life of the blessed and following the way of Jesus does not, however, mean always being cheerful. Someone who is afflicted, who suffers injustice, who does everything he can to be a peacemaker, knows what it means to suffer. It is most certainly not easy for you to live far from home, missing the affection of your loved ones, and perhaps also feeling uncertainty about the future. But the Lord is faithful and does not abandon his people. A story from the life of Saint Anthony the Abbot, the great founder of monasticism in the desert, may be helpful to us. He left everything for the Lord and found himself in the desert. 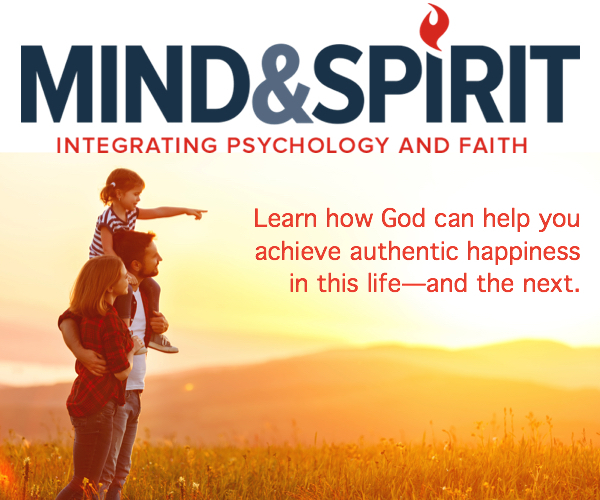 There, for a time, he was immersed in a bitter spiritual struggle that gave him no peace; he was assaulted by doubts and darkness, and even by temptation to give in to nostalgia and regrets about his earlier life. But then, after all this torment the Lord consoled him, and Saint Anthony asked him: “Where were you? Why did you not appear before to free me from my suffering? Where were you?” But then he clearly heard Jesus’ answer: “I was here, Anthony” (Saint Athanasius, Vita Antonii, 10). The Lord is close. It can happen that, when faced with fresh sorrow or a difficult period, we think we are alone, even after all the time we have spent with the Lord. But in those moments, where he might not intervene immediately, he walks at our side. And if we continue to go forward, he will open up a new way for us; for the Lord specializes in doing new things; he can even open paths in the desert (cf. Is 43:19). Dear brothers and sisters, I want to tell you that living out the Beatitudes does not require dramatic gestures. Look at Jesus: he left nothing written, built nothing imposing. And when he told us how to live, he did not ask us to build great works or draw attention to ourselves with extraordinary gestures. He asked us to produce just one work of art, possible for everyone: our own life. The Beatitudes are thus a roadmap for our life: they do not require superhuman actions, but rather the imitation of Jesus in our everyday life. They invite us to keep our hearts pure, to practice meekness and justice despite everything, to be merciful to all, to live affliction in union with God. This is the holiness of daily life, one that has no need of miracles or of extraordinary signs. The Beatitudes are not for supermen, but for those who face up to the challenges and trials of each day. Those who live out the Beatitudes according to Jesus are able to cleanse the world. They are like a tree that even in the wasteland absorbs polluted air each day and gives back oxygen. It is my hope that you will be like this, rooted in Christ, in Jesus and ready to do good to those around you. May your communities be oases of peace. Finally, I would like to consider for a moment two of the Beatitudes. First: “Blessed are the meek” (Mt 5:5). Those who attack or overpower others are not blessed, but rather those that uphold Jesus’ way of acting, he who saved us, and who was meek even towards his accusers. I like to quote Saint Francis when he gave his brothers instructions about approaching the Saracens and non-Christians. He wrote: “Let them not get into arguments or disagreements, but be subject to every human creature out of love for God and let them profess that they are Christians” (Regula Non Bullata, XVI). Neither arguments nor disagreements – and this also applies to priests – neither arguments nor disagreements: at that time, as many people were setting out, heavily armed, Saint Francis pointed out that Christians set out armed only with their humble faith and concrete love. Meekness is important: if we live in the world according to the ways of God, we will become channels of his presence; otherwise, we will not bear fruit. Second: “Blessed are the peacemakers” (v. 9). The Christian promotes peace, starting with the community where he or she lives. In the Book of Revelation, among the communities that Jesus himself addresses, there is one, namely Philadelphia, that I think bears a likeness to you. It is a Church which, unlike almost all the others, the Lord does not reproach for anything. Indeed, that Church kept Jesus’ word without renouncing his name and persevered, went forward, even in the midst of difficulties. There is also a significant detail: the name Philadelphia means brotherly love. Fraternal love. Thus a Church which perseveres in Jesus’ word and fraternal love is pleasing to the Lord and bears fruit. I ask for you the grace to preserve peace, unity, to take care of each other, with that beautiful fraternity in which there are no first or second class Christians. May Jesus, who calls you blessed, give you the grace to go forward without becoming discouraged, abounding in love “to one another and to all” (1 Thess 3:12).